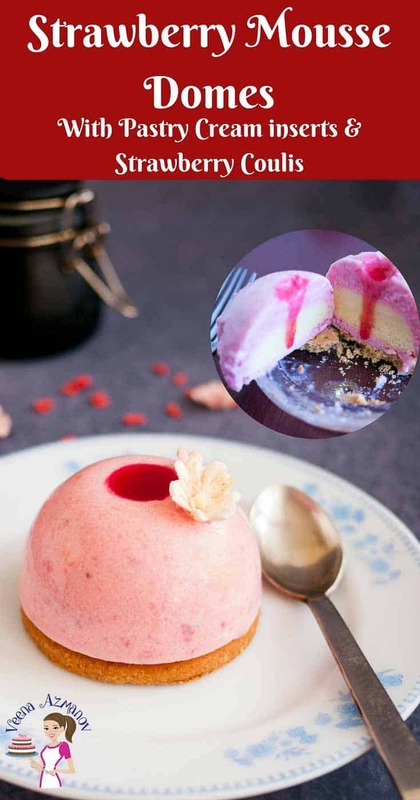 These strawberry mousse domes make perfect entremets to serve when you want something elegant and delicious. 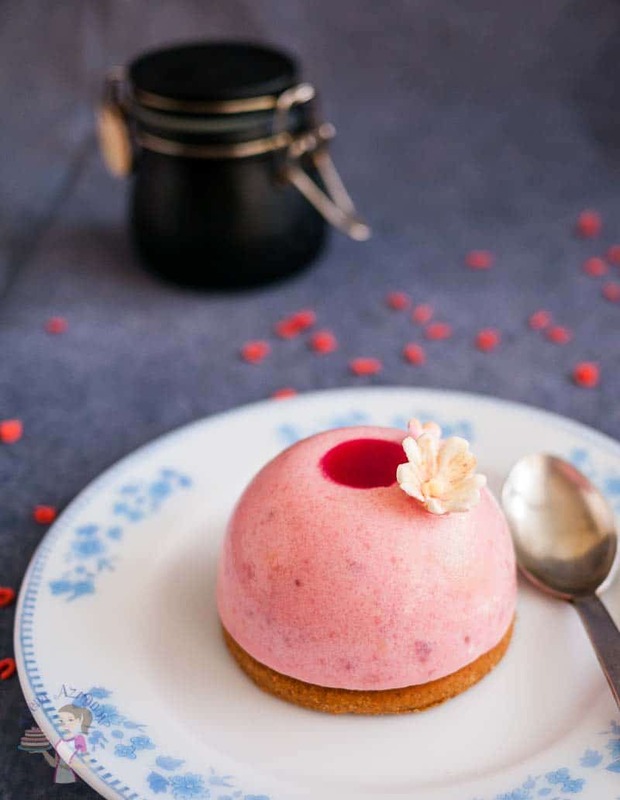 This simple and easy recipe makes a fresh, light and luscious strawberry mousse with a pastry cream insert, served on a hazelnut crust, topped with a dash of strawberry coulis. A great dessert to show off your dessert skills. What do you do when you want to show off your dessert skills. 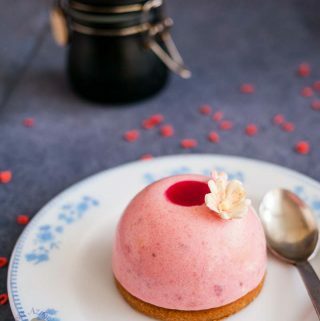 You take something as simple as a strawberry mousse and complicate it with a few more additions!! I’m not joking! 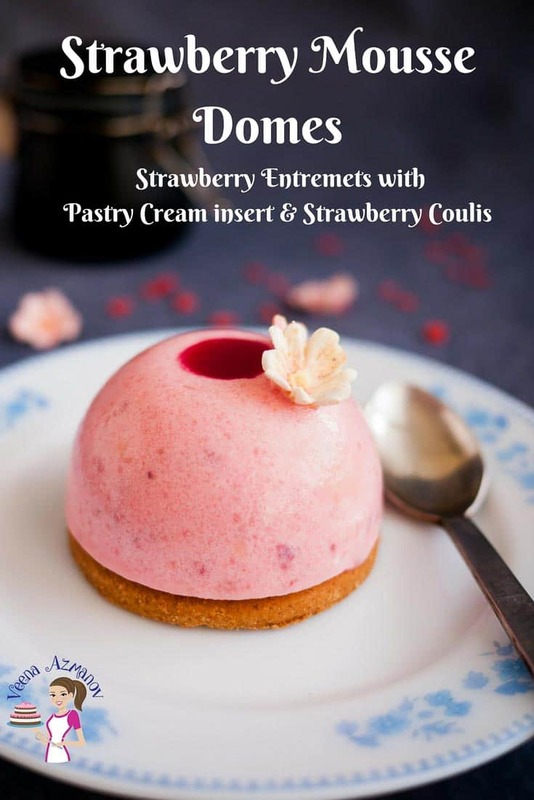 So, if you love desserts you will love these strawberry mousse domes. They are really simple and easy to make. The only problem is that it involves a bit of planning ahead of time and a few others to jazz it up a bit. You can make this delicious hazelnut cookie crust ahead of time. Either bake the cookies and save them in a cookie jar for later use or chill the dough until you are ready to bake the cookies. The vanilla pastry cream domes can be made ahead of time and stored in the freeze – They will last in the freezer at least a week. 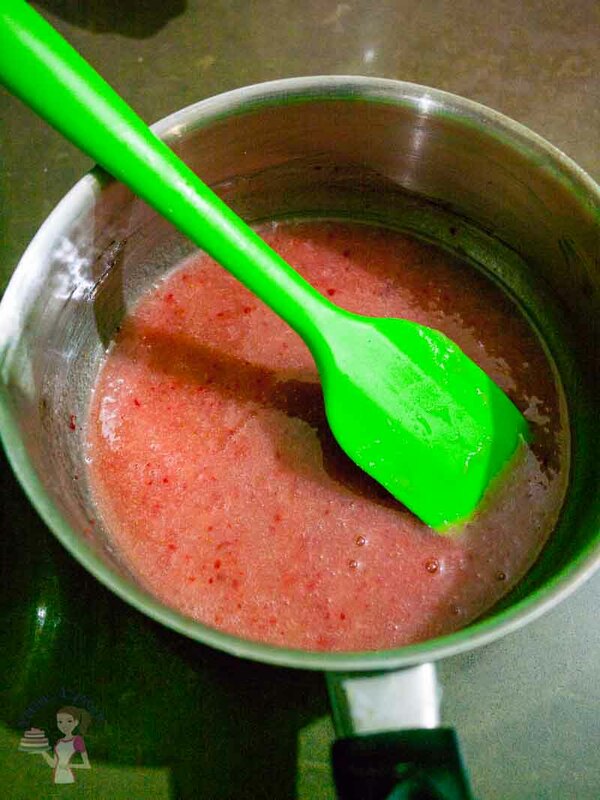 Strawberry coulis is a treat on its own – make head; better yet make more.. it will store in the fridge for a week. 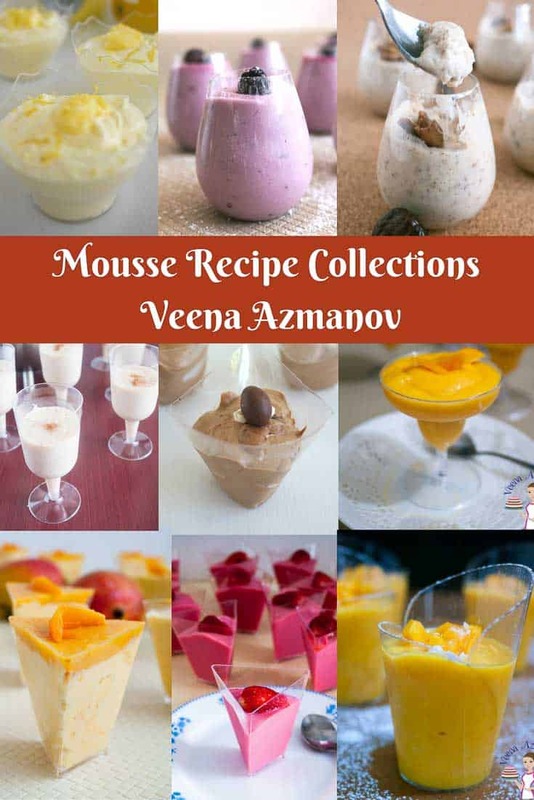 They are great to pour on pancake and waffles, desserts and ice creams. Hazelnut meal – A nut meal is basically just ground nuts. These are available commercially but can be easily made at home in a food processor. I am using hazelnuts here but you could substitute with any other nuts that you love and will pair well with strawberry. If you make nut meal at home in a food processor -add a little of the sugar or flour from the recipe to keep it dry so the oils that are released from the nuts will not make a paste instead of a meal. Brown sugar – I love the combination of brown sugar with hazelnuts but you can use the same quantity of white sugar just as well. Cornstarch – I am making an eggless vanilla pastry cream and so I’m using cornstarch instead of egg yolks. This helps thicken the milk and give us the consistency of pastry cream. Strawberries – These are in season at the moment so I have used fresh here but frozen works just as well. Having said that the strawberry can also be substituted with other berries such as raspberries or blackberries. 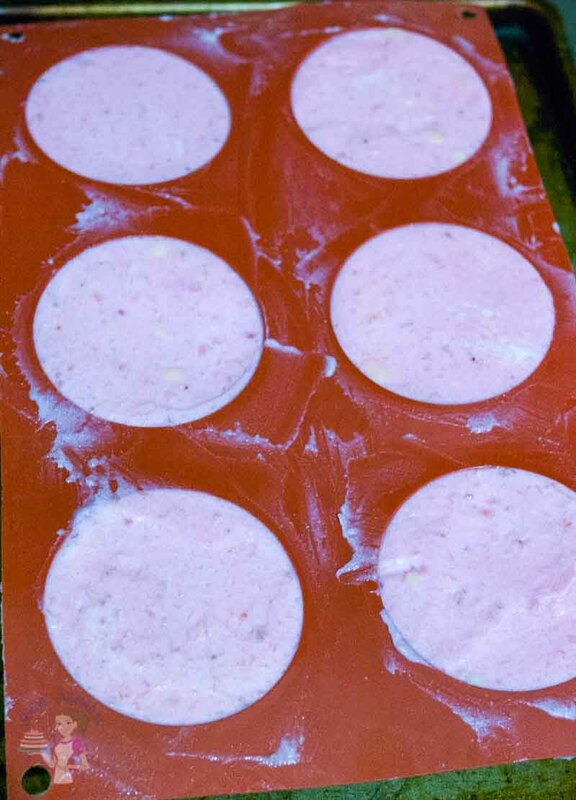 Pink Food Color – The strawberries don’t make the mousse a nice bright pin color as you can see, so I prefer to add a drop of Pink gel food color to enhance it. Feel free to omit the color if you prefer the natural color. Today I am keeping this recipe simple and easy, so I have used the eggless vanilla pastry cream as my base. I shared the eggless version in more details in this post here. But you can also use my classic vanilla pastry cream made with egg yolks and you can find the full recipe for that here – Classic Vanilla Pastry Cream. This recipe used agar-agar because it’s a vegetarian substitute for gelatin but feel free to use regular gelatin instead. If the mixture is still crumbly add milk just enough to form a dough. Cool completely on a cookie rack before you store in an airtight jar. Cook on medium heat until the milk comes to almost boil. Add vanilla and remove from heat. Smooth the top, cover with cling wrap and place in the freezer until firm. Save remaining one cup vanilla pastry cream for the strawberry mousse below. While still room temperature – strain thru a sieve and set aside. Add gel food color until well combined. Use a spatula to level the top and scrape any excess. Cook on low until the strawberries are cooked completely. Alternatively, you can glaze the whole dome with a pouring consistency strawberry coulis before you place it on the cookie crust. Garnish with a slice of strawberry or mint leaf. Let thaw in the fridge for an hour before you serve so the mousse is soft not frozen. While still room temperature - strain thru a sieve and set aside. 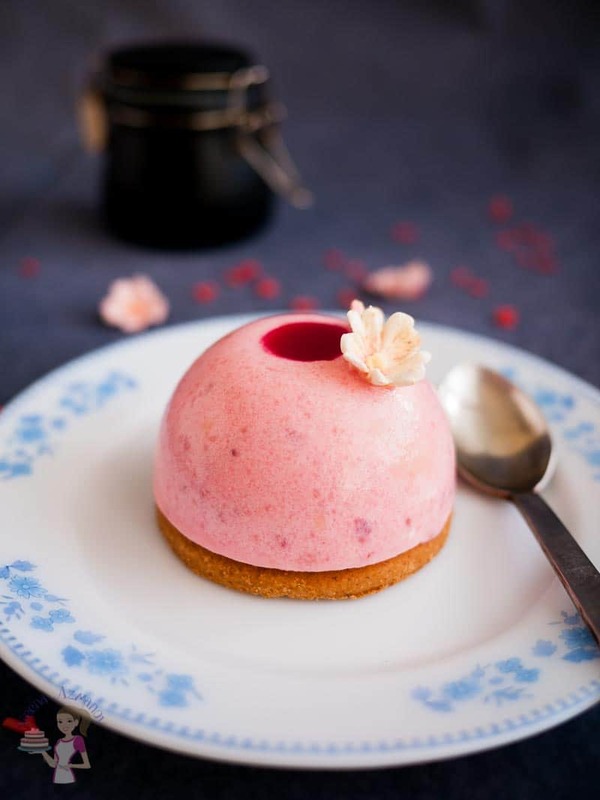 Top with a teaspoon of thick strawberry coulis - Alternatively you can glaze the whole dome with a pouring consistency strawberry coulis before you place it on the cookie crust. it is not easy to find blog posts that are as detailed as yours on this type of dessert, so I appreciate it very much. Thank you, Sally. Thank you for the lovely comment. Will definitely visit your site. Made these last week and they were so easy to make. They do look impressive but not so complicated. Thank you for sharing we loved it. Thank you so much Glad. So happy to hear that you enjoyed this recipe. Thank you for coming back to write this feedback. Appreciate it very much. Thanks for the reply! One more question: when do I add the reserved pastry creme to the mousse? Thanks again! Add the vanilla pastry cream just before you add the whipped cream – Thanks Sarah. Looks awesome and about to make this! How much vanilla goes into the pastry? Am I missing it? Thanks! Hey Sarah. 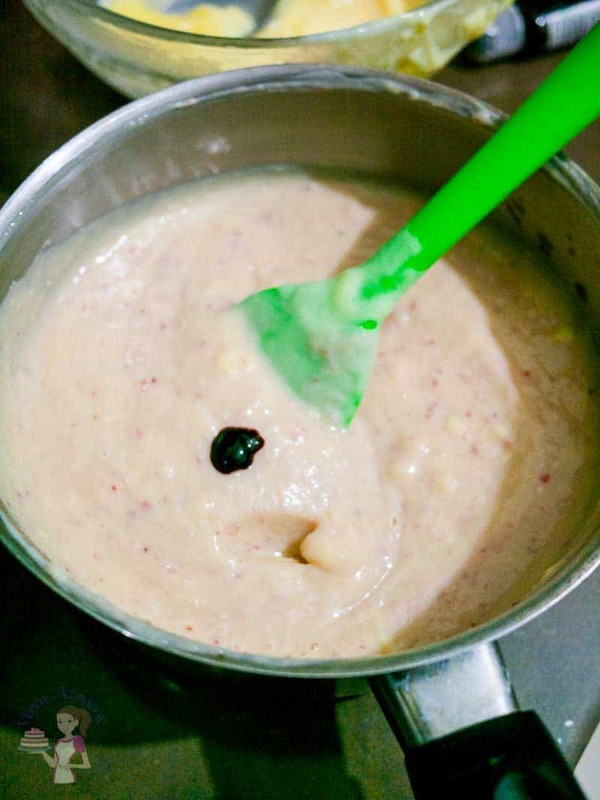 I use 1 tsp vanilla bean paste or scrapings from half a bean. Thanks. Thanks! When do I put the pastry cream in the mousse?? Just before you add the whipped cream. Thanks Sarah. Wow these look stunning! I’m not sure I could make these! My baking skills are beginner at best! But wowsa! So gorgeous! Thank you Samaresh. I’m sure she will love it… Enjoy! I will try this dessert with almond meal crust as hazelnut is allergic to my son. I like the strawberry mouse and strawberry coluis. My kids will like it for sure. Hey Swathi. Yes, almonds would just fine. I think your kids would love this very much. So fancy and pretty. They are tooo pretty to eat. I could look at them all day. Perfect dessert for Valentine’s day! Thanks April. 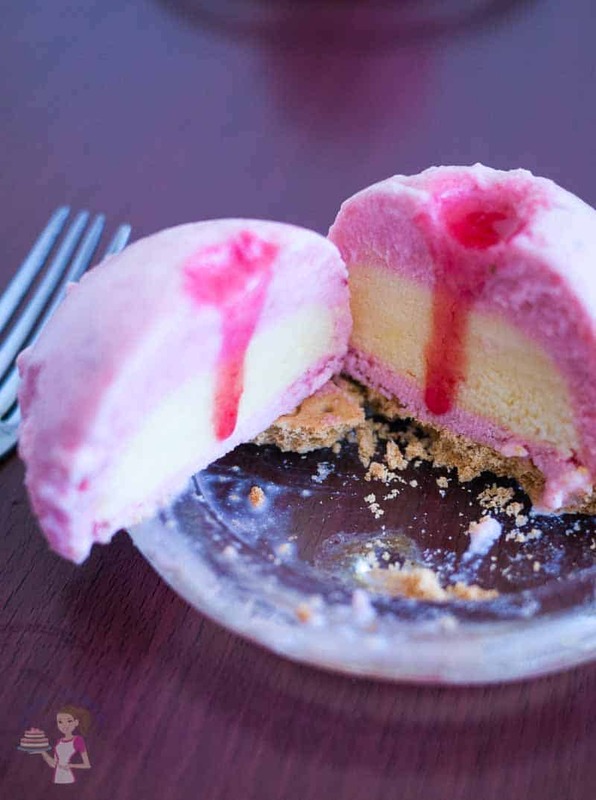 Definitely perfect dessert for valentine’s day or any other day. Veena, I’d love to slice into one of these beautiful little domes! They are so elegant and pretty…I’d love one right now. Thanks Catherine. They do look pretty and elegant but so easy to make too. This is one of the most prettiest desserts I’ve ever seen. You make it sound so easy to make too. Love the fact that many of the components can be made ahead of time. These look perfect Valentine’s day treat. Thanks Pavani. It really is simple and easy – just a few extra steps and a lot of in between time but the technique and process is simple. What an adorable looking dessert! You do such a great job with individual treats. The presentation is super sophisticated! 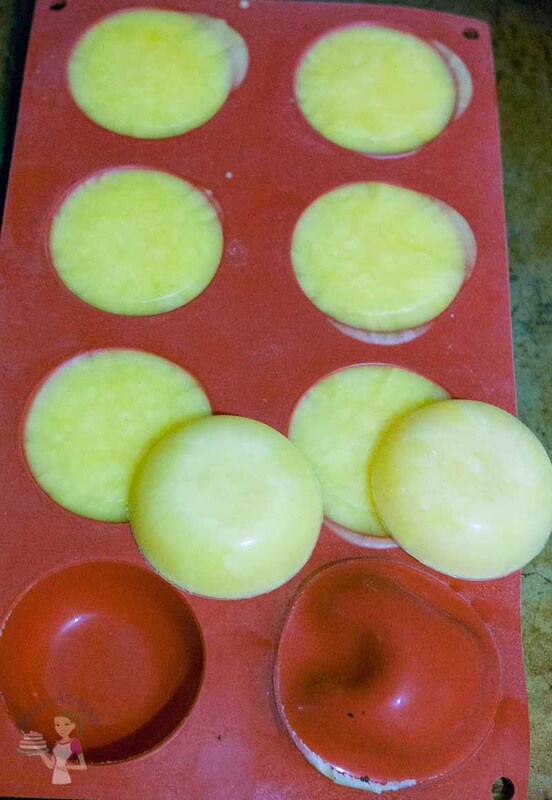 I’m going to have to look into those silicone molds. I’d love to make that for Valentines Day but I couldn’t gather everything up in time. This would make a great spring and summer dessert. Thank you Marisa. These are definitely worth making any time of the year not just Valentine’d Day. Isn’t this a divine little dessert. What a great end to a meal. Perfect for company…since the presentation is awesome. I love this…and need to make it soon. Absolutely Gloria. Perfect for company or just a weekend treat. We love such desserts in our home. 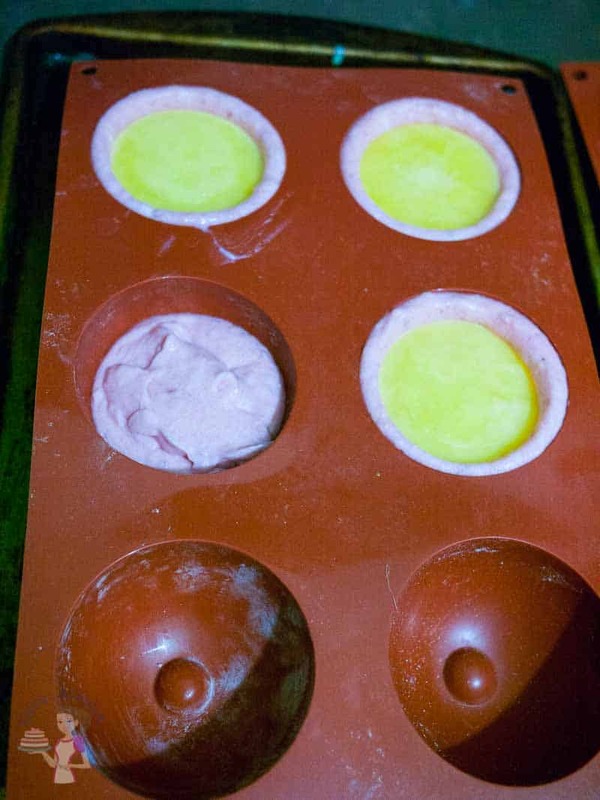 I’m gonna look into getting those silicon molds too! Thank you Jessica. Yes it is seriously very easy and simple to make but looks incredibly elegant and sophisticated. I have not doubt you do a great job too! If I can make that I would be the star in my house. That looks so pretty Veena and I can’t even imagine doing that. Your post is so detailed, that I want to give it a try. Love the fact that everything can be made ahead of time. Thank you Sandhya. I have not doubt you already are a star!! Your dishes are absolutely amazing. This looks very elegant and sophisticated but it’s really simple and easy to make. I have not doubt you will have fun and surprise yourself. This is like a work of art! Love it however I am not sure if I will eb able to do it as perfect as yours. This looks like a fancy restaurant quality dessert. I want some! Thank you Adriana. It look complicated but it really is not..! I’m sure your will be as gorgeous as mine.